A call to Camper & Nicholsons confirms that Jean-Marie Recamier has brought the 44.2m superyacht Idyllwild back to the market. 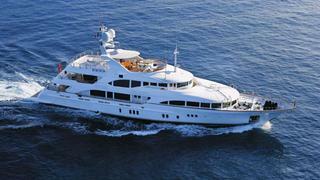 Designed by Stefano Righini, Idyllwild was buit by Benetti in 2005 to Lloyd's class and MCA compliant. An excellent example of the yard's Vision series, she has an elegant Francois Zuretti interior in cherrywood and fine marbles and fabrics. Accommodation is for 10 guests in five staterooms including a main-deck full-beam master suite. Twin Caterpillar 1,300hp engines give her a cruising speed of 14 knots and a range of 4,000 nautical miles. Available to view in France, Idyllwild is asking €12,750,000.